How much do Rockies suites cost? Prices typically range from $4,000-$5,000 for Colorado Rockies suites. Prices vary based on day of game, opponent, and the location of the suite in Coors Field. Luxury suite prices for concerts and other events at Coors Field can vary widely based on the type of event. A Rockies suite will include 24 tickets and 7 VIP parking passes. You do have an option to purchase up to 8 additional suite tickets. Each Rockies suite at Coors Field features a climate-controlled environment, outdoor and indoor seating, premium in-suite catering options and a dedicated suite attendant. This Colorado Rockies suite will include 12 tickets with an option to purchase up to 8 additional suite tickets. Along with the Rockies suite, guests will receive VIP parking, private entry into Coors Field and exclusive access to VIP lounges on the suite level. A Rockies suite will feature HDTVs, interior/exterior seating, premium in-suite catering options and a dedicated suite attendant. The Colorado Rockies and Nolan Arenado are going to be sticking around for years to come. That’s the best news any Rockies fan can ask for this past offseason. Arenado has signed an eight-year contract extension worth $260 million. In terms of offense and defense, Arenado maybe baseball’s best all-around player. With Arenado’s extension and extending the contract of manager, Bud Black, the Rockies feel like they’re going to be a force to be reckoned with in the NL West. The offense is always the talking point for the Rockies. Coors Field can bring out the best in a hitter and they hope Daniel Murphy, who already is a great batter, could see his best seasons yet. Murphy signed a two-year deal with the Rockies to play first base. All-Star Charlie Blackmon leads off for their dynamic lineup and it only gets tougher from there. Ian Desmond, Trevor Story and David Dahl are all players who can go deep at any at-bat. The Rockies starting rotation had one of their best years collectively in 2018. In 2019, they hope Kyle Freeland and German Marquez pick up where they left off. Jon Gray and Tyler Anderson are looking to put a consistent season together showcasing the talent they’ve showed in stretches. The bullpen is led by closer Wade Davis with a solid staff from there including Jake McGee and Seunghwan Ho. Coors Field will offer fans a suite experience down either baseline. A Rockies suite can accommodate 12 – 30 people on average. With a suite at Coors Field, guests receive VIP parking, private entry into the ballpark and premium in-suite catering options. Rockies suites are going to range in price based on the opponent and the location of the suite in Coors Field. On average, a suite for a Rockies game could go for $4,000 - $6,500. The Colorado Rockies will look to return to the postseason in 2018. Last year, the Rockies surprised many around Major League Baseball with a record of 87-75, but they fell short in the National League Wild Card Game. With a revamped bullpen and a powerful lineup, the Rockies are poised to return to the playoffs this season. The Rockies were perhaps the most aggressive team in terms of creating an elite bullpen during the off-season. General manager Jeff Bridich dished out over $106 million in contracts to relievers Wade Davis, Bryan Shaw, and Jake McGee. No team has ever invested so heavily in their bullpen, but the Rockies believe it will help balance out their dynamic offense. Bud Black expects to have plenty of assets at his disposal to use in the late innings during October. Playing in mile high conditions, the Rockies have always produced a ton of runs. There’s never a shortage of offense during the summertime at Coors Field, and this year should be no different with MVP candidate Nolan Arenado leading the charge. All-Stars Charlie Blackmon and D.J. LeMahieu excel at getting on base ahead of Arenado, meaning he should once again find himself among the league leaders in RBI’s. Blackmon and LeMahieu both expect to compete for the National League batting title in 2018, an achievement Blackmon won last season and LeMahieu won two seasons ago. Rounding out the lineup, Ian Desmond and Trevor Story provide plenty of pop themselves. The new ace of the pitching staff, Jon Gray, enjoyed a career year last season. Despite the home field conditions that have crippled starting pitchers in the past, Gray won 10 games and posted a 3.67 ERA. Behind Gray, Tyler Anderson, German Marquez, and Chad Bettis will look to solidify the starting rotation. Watch the Rockies battle for the NL West title from a private luxury suite. Luxury boxes at Coors Field offer both indoor and outdoor seating from your suite. With a Rockies skybox, guests receive VIP parking, premium in-suite catering options and a dedicated Rockies suite attendant. 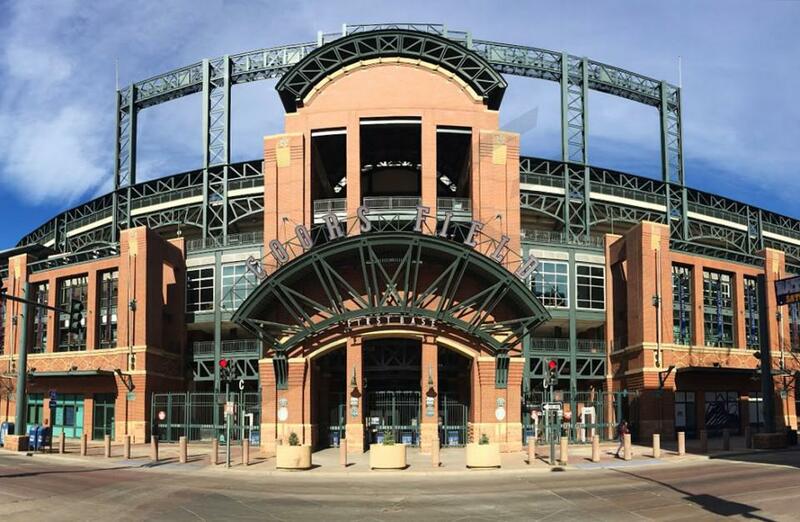 Enjoy private entry into Coors field and exclusive access to VIP clubs in the stadium. The price for a Rockies suite will vary by the opponent, day of the week and location of the suite. The 2017 Colorado Rockies are going to be one of the best offensive teams in baseball. The lineup is fill players who can not only hit home runs but guys who can bat for a good average as well. Nolan Arenado is an MVP candidate along with Carlos Gonzales. Before his injury, Trevor Story became a household name after taking over for Troy Tulowitzki. With Arenado, Gonzales and Story in the middle of the lineup, the Rockies have Charlie Blackmon and DJ LeMahieu at the top of the order. The Rockies signed free agent, Ian Desmond to play first base this year. Rookie outfielder David Dahl played great after being called up last year, Dahl will be given a shot to be the Rockies everyday left fielder in 2017. Gerardo Parra and Mark Reynolds will also be in the mix when the starters need a day of rest. Pitching is always a battle at Coors Field although this year could be different. Manager Bud Black has a new ace in John Gray. Gray in his first year in the big leagues performed a very well finishing with a 3.38 ERA. Behind Gray, the rotation will round out with Chad Bettis, Tyler Chatwood, Tyler Anderson and Jeff Hoffman. The bullpen got an upgrade in the offseason with the signing of Greg Holland. Holland, Jake McGee and Adam Ottavino could all see opportunities as the Rockies closer. Watch the Rockies battle in the NL West from a private luxury suite. Luxury boxes at Coors Field offer both indoor and outdoor seating from your suite. With a Rockies suite, guests receive VIP parking, premium in-suite catering options and a dedicated Rockies suite attendant. Enjoy private entry into Coors field and exclusive access to VIP clubs in the stadium. The price for a Rockies suite will vary by the opponent, day of the week and location of the suite. The 2016 Colorado Rockies are looking to end a streak of five consecutive losing seasons. With big trades dating back to mid-season last year to this offseason, the Rockies are rebuilding but not from ground zero. Stars like Nolan Arenado, Carlos Gonzales and Charlie Blackmon still provide plenty of power in this lineup. As many Rockies fans know, Troy Tulowitzki is no longer on the team after being traded to the Blue Jays at the trade deadline last season. The Rockies have a new face of the franchise in Arenado. The shortstop had a breakout year last season with 42 home runs. Gonzales also hit over 40 home runs for the club, giving the Rockies one of the best hitting duos on any roster in baseball. DJ LeMahieu also had a career year last season as the Rockies everyday second baseman. The Rockies traded Corey Dickerson, which opened up a spot in the outfield for free agent Gerardo Parra. Jose Reyes was involved in domestic abuse charges during the offseason and will likely face a suspension for his involvement. Which could open the door for top prospect Trevor Story. Story should get a call-up at some point this season but will start in the minors. The Rockies won’t have an issue putting up runs at Coors Field, as usual, it’s the pitching that makes or breaks the Rockies season. The Rockies pitching rotation will be led by Jorge De La Rosa. While is an efficient starter, he’s not the top ace this club hopes to have going forward. Chad Bettis and Jon Gray are two young pitchers who will start the season as starters. Both got called up last season but the Rockies are hoping Bettis and Gray will be at the front of their rotation for years to come. Jordan Lyles and Tyler Chatwood will fill out the rest of the spots. The Rockies did upgrade their bullpen by acquiring Jake McGee from the Rays. McGee will step in right away as the team’s closer. Jason Motte will also get some save chances but should be the set-up man. The pitching unit overall could see better numbers as the fences at Coors Field are being raised. So they should be able to keep hitters in the ballpark more often. Watch the Rockies battle in the NL West from a private luxury suite. Coors Field suites offer both indoor and outdoor seating. Rockies suites include VIP parking, in-suite catering options and a dedicated suite attendant. Along with your luxury box, guests will have private entry into Coors field and exclusive access to VIP clubs. Suites for Rockies games offer the perfect setting for both business and pleasure. Despite finishing 2014 with just 66 wins, the Colorado Rockies proved they are one of the most exciting teams to watch in baseball. The Rockies led the National League in home runs and runs scored by a large margin. Leading this offensive juggernaut is superstar Troy Tulowitzki, Carlos Gonzales, Justin Morneau, Nolan Arenado, Corey Dickerson and Charlie Blackmon. Both Dickerson and Blackmon were huge surprises for the Rockies in 2014. Arenado has won back-to-back Gold Glove Awards in his first two seasons. Manager Walt Weiss knows his lineup is one of the best in baseball when healthy but his two biggest stars, Tulowitzki and Gonzales have been injury prone most of their careers. Pitching in Coors Field has always been a struggle with the thin air. The Rockies rotation will be led by Jorge De La Rosa, Jhoulys Chacin, Jordan Lyles and Tyler Matzek. You can watch the Rockies take the field from a private luxury suite at Coors Field. Rockies suites offers indoor and outdoor seating, keeping fans warmer on colder days. Rockies luxury boxes include VIP parking, in-suite catering options and a climate-controlled environment. A Coors Field suite will include 24 tickets with an option to purchase 8 additional suite tickets. Thank you for signing up for specials at Coors Field. Enter your email address below to stay in touch. We'll sign you up for our newsletter, which will inform you of the latest inventory and events at Coors Field. We promise we will never sell or distribute your information. The seating chart below shows where the Colorado Rockies suites at Coors Field are located.